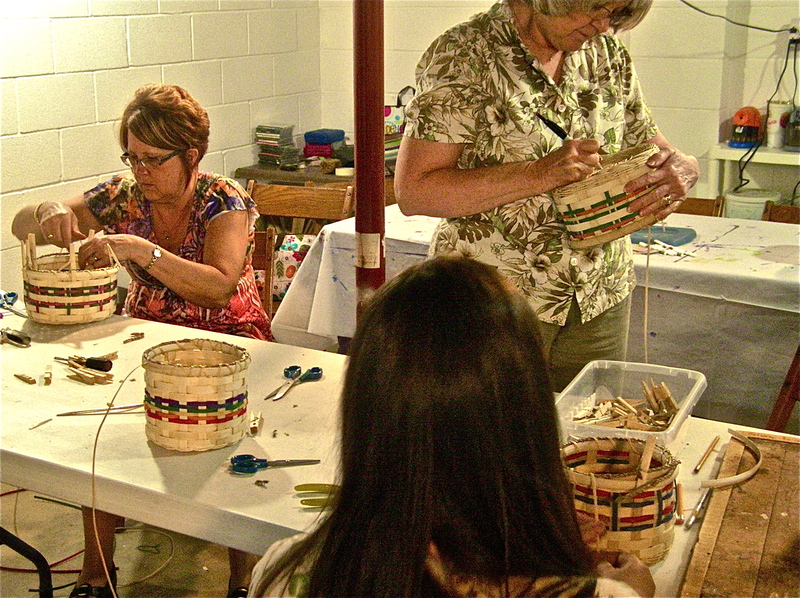 On June 30th the Art Junction held it’s first basket weaving workshop. 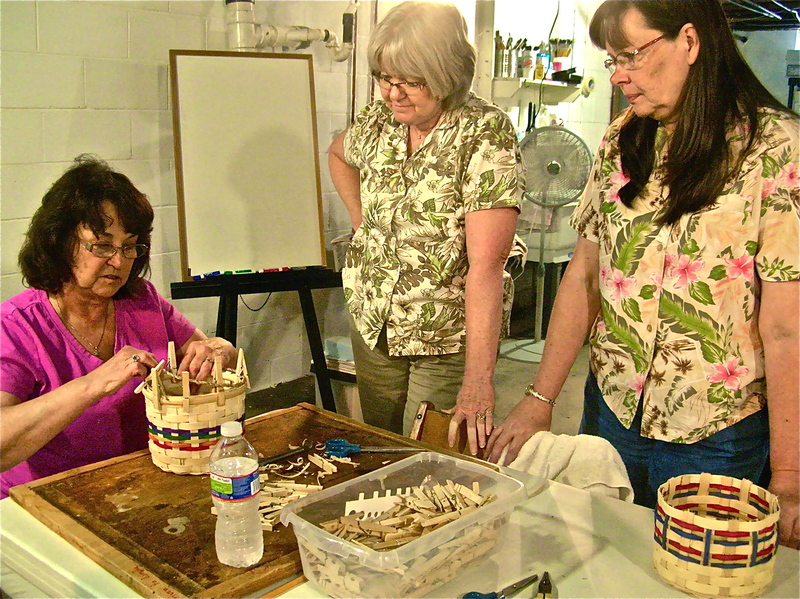 Linda Kirgis led the workshop, teaching and demonstrating how to create a small, round reed basket. What kind of basket should a Beginner start with? Any simple structure will do. The students in this workshop created a round made of flat materials. “Round” means a basket that has spokes in a radiating base pattern- like the spokes of a wheel. “Square” means any kind of simple square or rectangular base pattern- woven like a checkerboard. “Melon” means the structure wherein 2 hoops are placed within each other & assembled with God’s eyes patterns. What are most baskets made of? 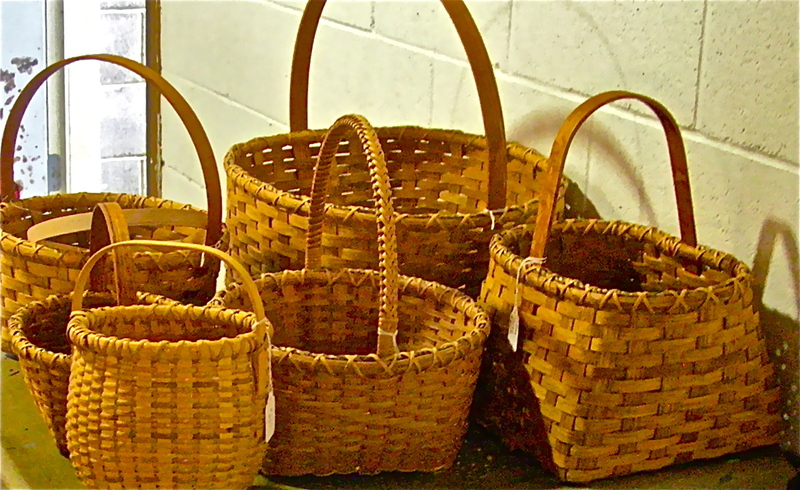 Antique American baskets have usually been woven of hardwoods like ash, oak & hickory. 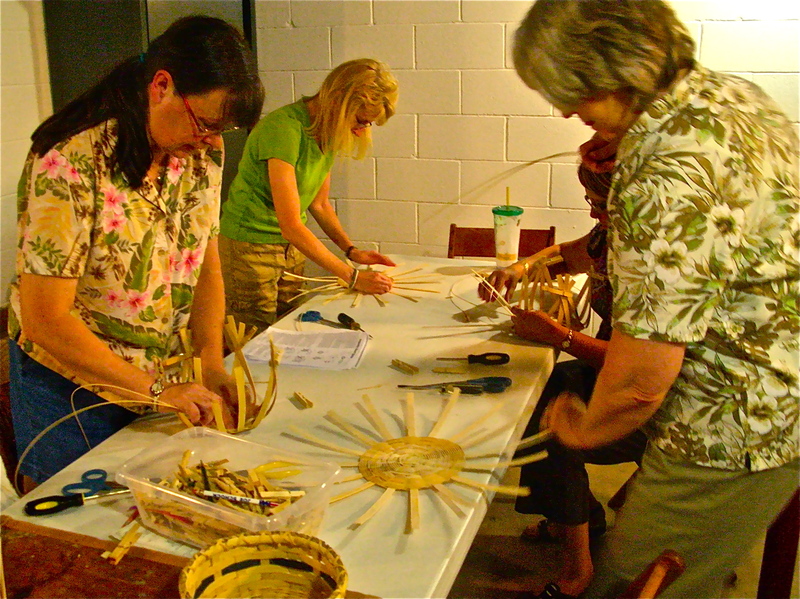 However, today most American basketweavers learning to weave use the tropical materials “reed” & “cane”. This is not to say that the hardwoods aren’t used, but they’re expensive and trickier to work with. Most patterns & kits will use reed and cane. What are “reed” and “cane”? Reed and cane are the products of the tropical vine “calamus rotang”. They’re harvested in various parts of Asia, then processed in factories into the different sizes of reed and cane. Reed is the inside of the vine, and cane is the outer bark. Cane is also the material used for woven chair seats. Flat reed comes in various widths as measured in fractions of inches: for example, 3/16″, 1/4″, etc. Round reed is measured in numbered sizes. Smallest numbers measure the smallest diameter. #1 is a very narrow weaver (spaghetti-sized), whereas #8 is a good sized spoke (almost pencil sized). Anything larger than #10 is generally furniture-gauged. Why are basket materials used wet? 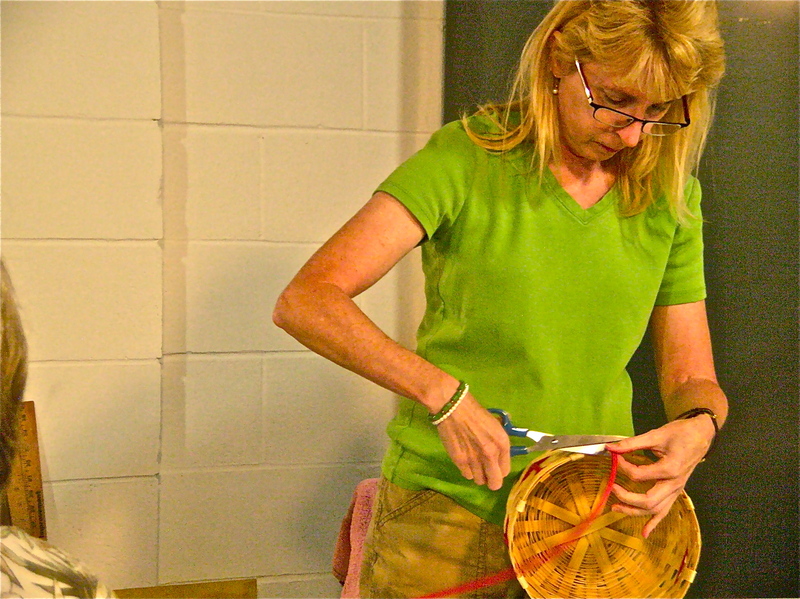 Basketry materials are too brittle to be woven in their dry state. When soaked for as little as 15-30 minutes, reed & cane become flexible and easy to manipulate without friction & breakage. How long will reed (and baskets) last? Baskets can last indefinitely if stored in a moderate climate. Not too dry (not in an attic) and not too wet (not in a humid area). Reed, however, has its limitations. 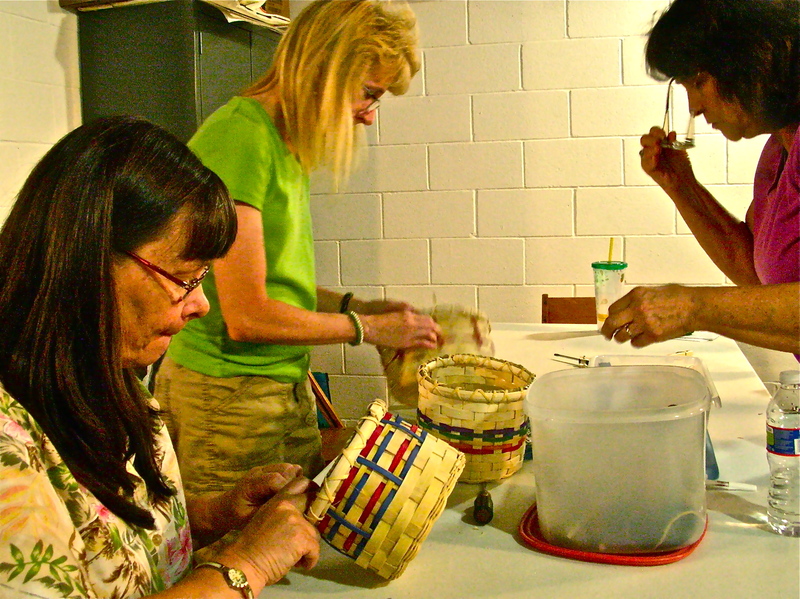 The only way to find out if your stored reed is useable for weaving baskets is to soak it for 15 minutes and try it out. If the reed is brittle and continues to break, it’s not worth weaving with. If my baskets are dusty, what’s the best way to clean them? 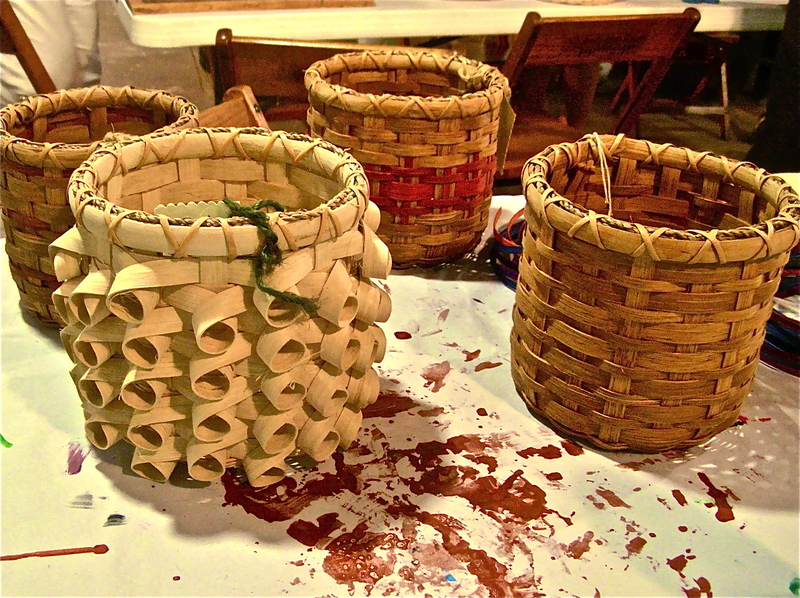 Assuming that we’re not talking about priceless antique baskets from early native American periods, the easiest and most efficient way to clean your baskets is with a garden hose. Hose off the dust and let them dry thoroughly. Baskets can also be put in the bathtub so that they freshen up by absorbing moisture directly. Once again, rinse off the dust and let them dry completely to avoid mildew. 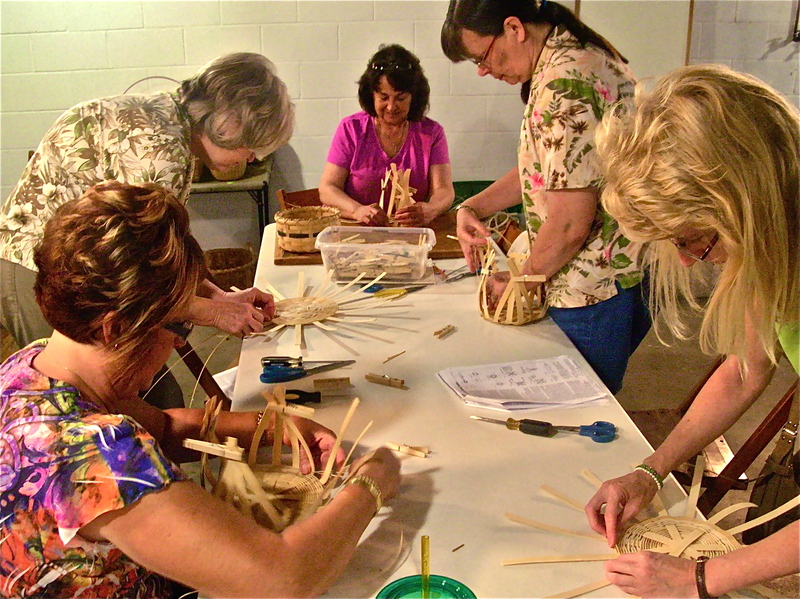 The participants did a wonderful job learning a new skill in this creative endeavor of basket weaving. They also have a great new basket they have made. 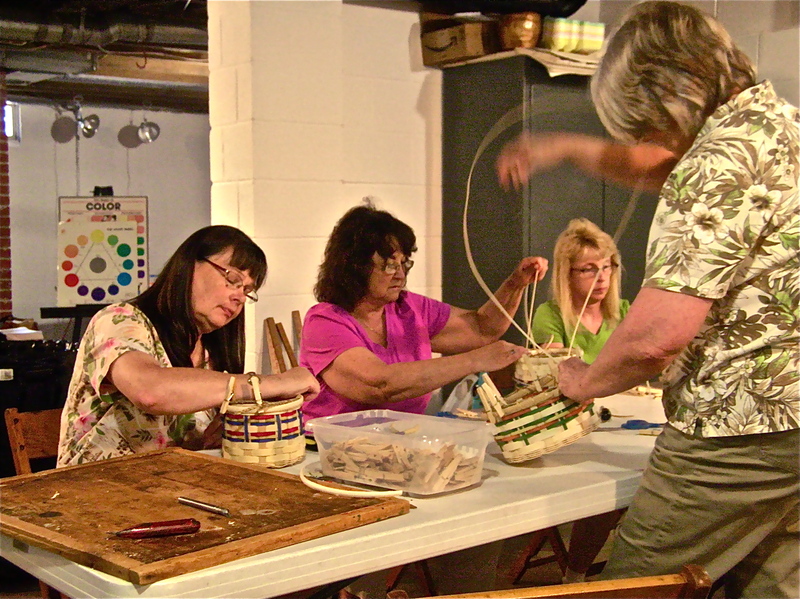 If this sounds interesting to you contact the Art Junction to inquire about future classes in beginning and advanced basket weaving at 419-935-3404 or email theartjunction@yahoo.com. ← Painting & Drawing together outdoors!